Plectranthus Scutellarioides , Lemon Dash, Compact Low Growing Cultivar With Golden Green Broad Leaves. 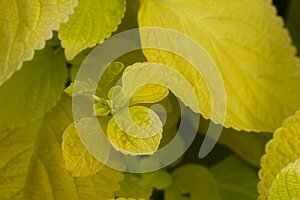 Photo title: Plectranthus scutellarioides , lemon dash, compact low growing cultivar with golden green broad leaves. Plectranthus scutellarioides `Wizard Sun Golden`, compact low growing cultivar with golden green broad leaves, in Birmingham Botanical Garden.